It began with two cards selected from the 78-piece tarot card-set as utilised by the most famous occultist of the 20th century Aleister Crowley. ”The Devil” and “The Universe” were the cards pulled that would prophesize a name for a musical-magical-transcendental composition and transformation project…..
Ashley Dayour – (instruments and voice), David Pfister – (instruments and field recordings) and Stefan Elsbacher (percussion) set out to create music from magical systems. Their aim was to give up their musical creativity and allow the legitimacy of magic and religious mechanisms form musical rules. The process and its system dictated and created not just phonetic anarchy but also examples of sound perfection. With this as their mission and the influence of Crowley’s tarot The Devil and the Universe were born. Using their transcendental music design and occult and religious iconography as inspiration they combined and reinterpreted these elements and influences to create a variety of musical offerings from Space Disco, Psychedelic Glam, Synth Pop, new wave and Black Metal. There is one musical style however that is very much The Devil and the Universe’s own and it is one they have christened `Goat-Wave’. Watching The Devil and the Universe live is when all the various influences come into their own and combine to create a magical experience. I don’t mean that in a Disney way (there are no enchanted castles and princesses here!) but in a truly occult sense of the word. The scene is set with images and film clips showing various robed figured in goat masks connecting with the landscape – communing and seeming taking inspiration from the sepia tinged rural landscape they roam across. First to enter the Church of the Goat is Stefan (although you wouldn’t know it was him under his robe and mask) and he immediately starts pounding out a tribal rhythm as if to call the audience together – to get us all breathing, swaying and hearts beating in unison to one hypnotic beat. Next David – once again fully robed and goated up – joins the swirling mist on stage and seems to merge with the visuals before joining in the rhythmic pulse. By now samples, field recordings and synth swathes envelop the audience entrancing them further as Ashley joins the others completing the Unholy Trinity. All three add to the growing sonic conjuration with the most unlikely of instruments – the wooden football rattle. Building the intensity until every person in the room – themselves included – is well and truly under the spell of The Church of the Goat. There is no let up. Even when there is a change in pace or style or when new instruments are brought into the mix there is no pause between tracks – no chance to break the spell. The whole experience is built around that tribal primeval rhythm – it hypnotises, seduces, entrances and completely captivates the audience and when all three on stage become robed silhouettes pounding against the backdrop of creeping visuals the effect is magnificent. 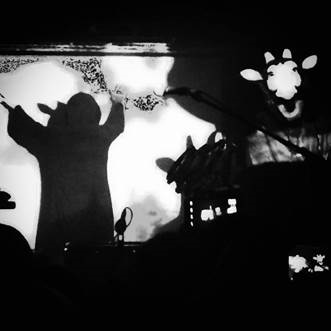 It is a shared experience – all those called to worship at the Church of the Goat do so as one. The John Carpenter-esque synths, crunching guitars, perfectly chosen samples and field recordings – plus an array of percussive instruments – all play their part in the sonic alchemy but it is so much more than that. What makes The Devil and the Universe such an unmissable live experience is the sum of many parts – the music, the robes, the masks, the visuals, the lights, the audience and the rhythm….that never ending rhythm….the rhythm of the Universe…and The Devil.